Posts tagged "5 Day Blog Hop"
Today is day 4 in our 5 Days of Crafty Lessons series in the 5 Day Summer Blog Hop with the Schoolhouse Review crew. Don’t forget to read Days 1, 2, & 3 in our series as well! There are so many things laying around your house right now that can be used for crafty lessons. 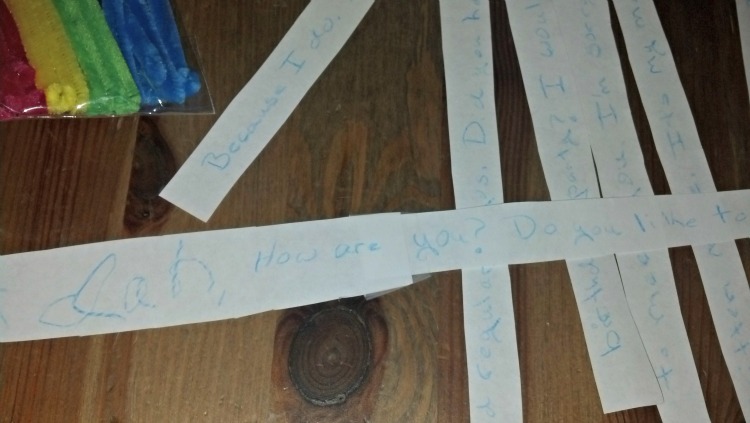 Jars, styrofoam peanuts, scraps of fabric, buttons… This list could go on for hours. When you are walking through the dollar store, check every aisle you walk down: Fake flowers, toy bugs, glue, markers… the list goes on and on. While making your lesson plans, and you know there are crafty lessons coming up, make notes of items you will need. Fur? Glitter? 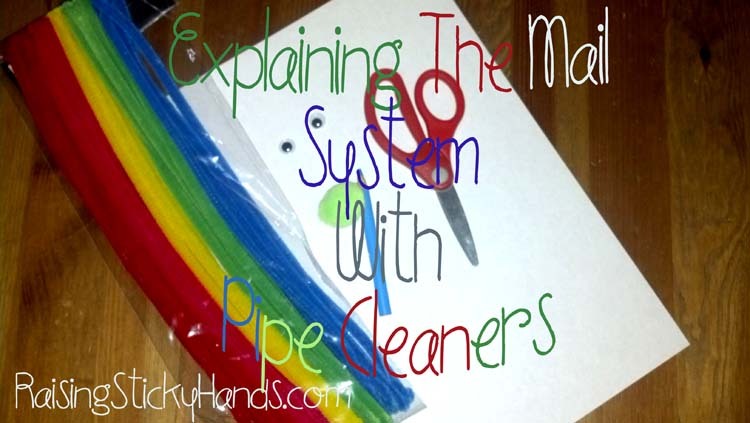 Pipe cleaners? Scrapbook paper? An old book? You may be amazed with what your imagination gives you to be in need of! Never limit yourself. But don’t go crazy breaking the bank either. Use discount stores, remnant bins at fabric stores, clearance racks, etc. Most crafts are not going to be saved for more than a season, so there is no point in spending a fortune on them. 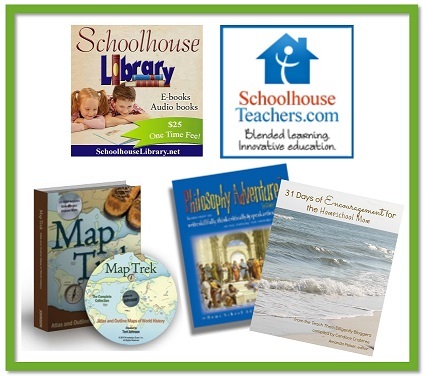 I hope you have found this series beneficial to your homeschool. It’s been a lot of fun to write! 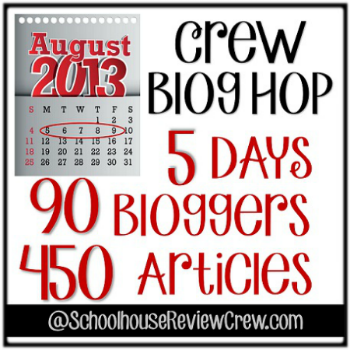 Be sure to visit the other 90 bloggers on the Schoolhouse Review Crew participating in this blog hop by clicking the image below. Thanks for stopping by! 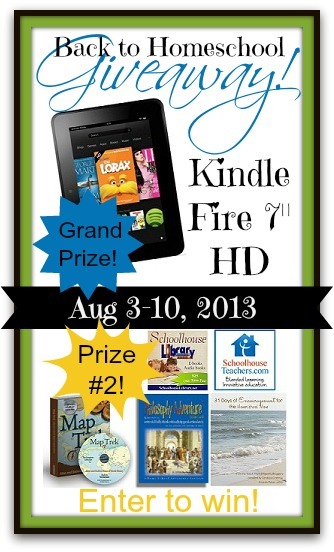 Psst… Don’t forget to head over and enter the Back To Homeschool giveaway and enter for your chance to win! This crafty lesson is a super easy one to do with your little one to help them understand addition. It doesn’t take much set up or clean up, and can be done in a few minutes or can be made longer to last over the course of a few days. 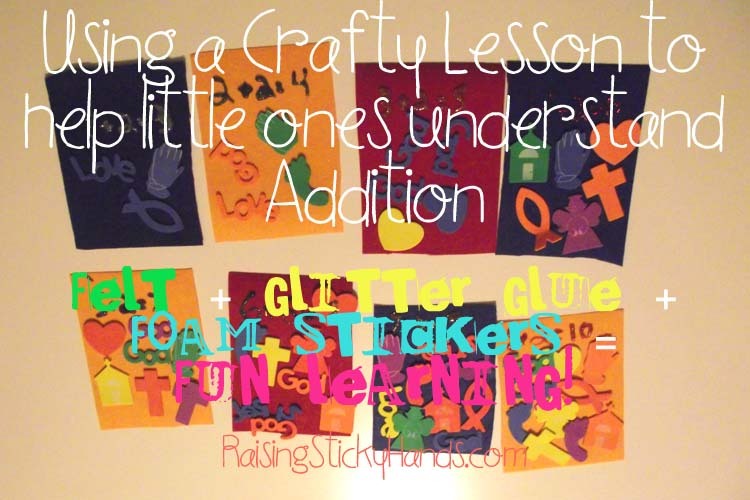 I began with this crafty lesson by writing “1” on a piece of felt with glitter glue. I then asked Tommy to find 1 foam sticker to put on the felt sheet. Once his 1 sticker was on the sheet, I then wrote “+2=” on the felt. Now I had him find 2 foam stickers and he applied them to the felt. I then pointed to the “1” sticker and the “2” stickers and said “1 + 2 =” and he counted up the stickers and exclaimed “3”! Sure, it came easily the first few rounds as we counted up to “8 + 2 =” before his little brother and sister woke up from nap, but the higher the numbers got the more he had to count, which is good for him. This was a good exercise to help him with his addition skills. Once it was all done, and the sheets were all lined up, he informed me that he will be making a book out of his creations to help teach his little sister about adding numbers. I gotta tell ‘ya, that melted my heart. 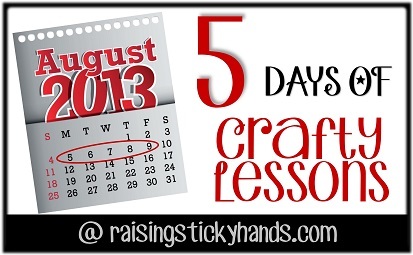 Come back tomorrow for the 5th day of our 5 days of Crafty Lessons! I’ll be sharing a list of great, low priced supplies to keep on hand for use in crafty lessons. 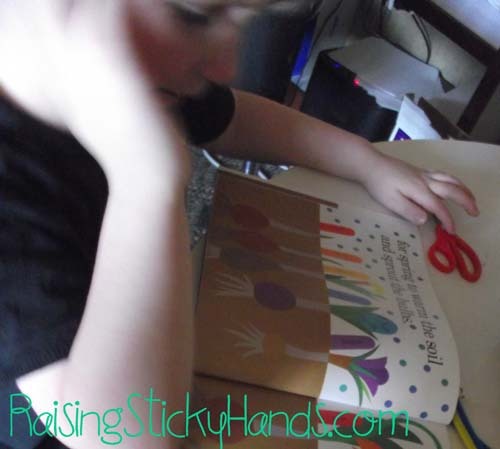 What would you do with the felt sheets once the crafty lesson was completed? Do like Tommy plans to and make a book, or would you do something else? Maybe include them in a busy bag or quiet book? I’d love to know! Today is day 3 in our 5 Days of Crafty Lessons series in the 5 Day Summer Blog Hop with the Schoolhouse Review crew. Don’t forget to read Days 1 & 2 in our series as well! 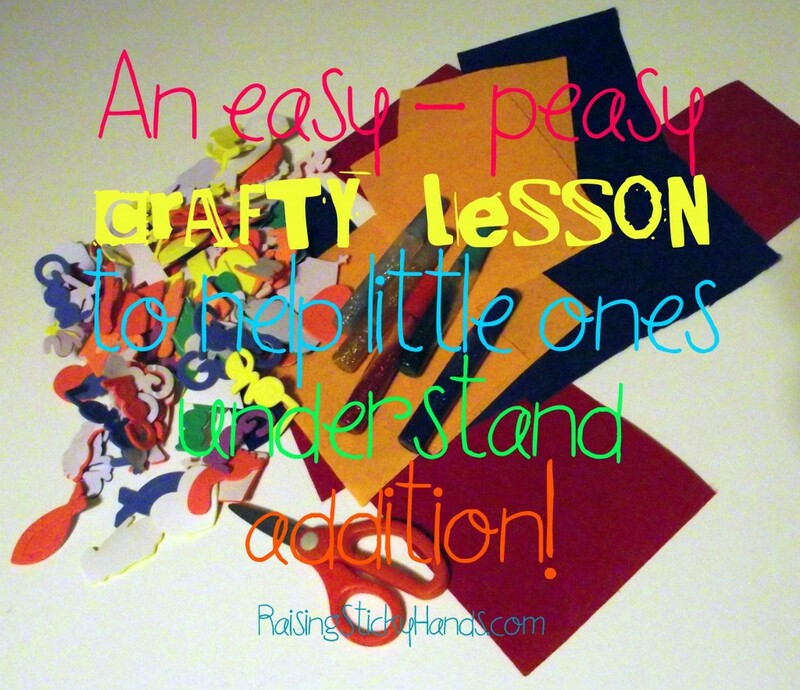 With this post I want to add some thoughts, and then we’ll get into another crafty lesson. When lesson planning, sometimes we as parents get excited. We are certain that this crafty lesson is going to cause our children to suddenly catch every little detail of what we are trying to convey, when usually that is just not likely. Grasp the majority of the lesson? Probably. All? Not usually. Don’t be upset if you have to go over it all again in different ways a few more times before they “get it” completely. Another problem that can come up is that in our imagination, we have this grand idea of how this craft is going to come out. It’s going to be just perfect and the kids are going to love doing every bit of it. Keep in mind, it is a child doing the craft, not a 22 year old art major. Let them use their imaginations, let them do it not so perfectly, and most of all, encourage them if there is a part of the craft that is tedious and they just want to give up. If they push through, the next step is most likely fun and they’ll forget they were ever upset. If the above 2 paragraphs are not remembered, you can quickly become discouraged and feel like you’ve wasted a lot of time. I’ve seen it happen with others and myself as well. Just keep on going, remember you are the best teacher your child can have… and some kids just don’t like crafts. There’s nothing wrong with that. The only reason I did this step without Tommy was because I knew he would not handle having to wait until the paint dried to move on to the next step. He did, however, catch me painting and asked what I was making. I just told him it was a surprise for school and he would find out soon. Once we were ready to do our lesson, I sat down with Tommy and explained the whole process. I began by telling him that we were going to be silly and pretend that some of our craft supplies were things found in nature. He “planted” the seeds into the holes by gluing them in… but would not let us move on to the next step until we covered the hole back up with pretend dirt. So for 2 minutes, we used “shovels” and filled the holes with imaginary dirt. 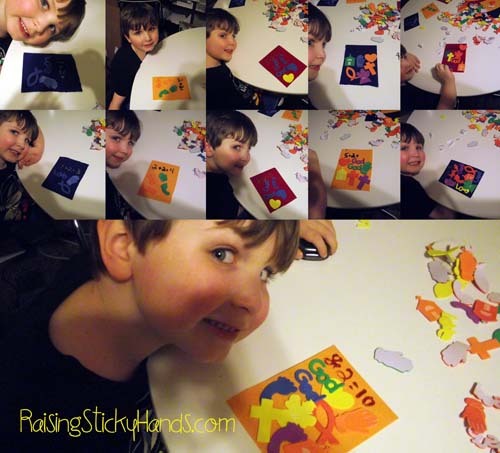 THAT was when I knew this crafty lesson was going to be a hit! Next I told him that a seed needs 3 things to grow: good soil (He pointed out that we already had that, smart alec. ), water, and sunlight. So we made a stand with pipe cleaners for our pretend rain to fall from, tore up a bunch of little pieces of tissue paper, taped the tissue paper to the string, and tied the string to the pipe cleaners… but not before he used an imaginary watering can to put water on the seed himself. Now, of course, we needed a sun! 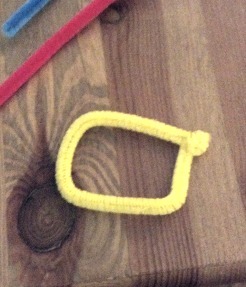 Again, we made a stand from pipe cleaners, but this time we made a circle at the top and inserted a yellow pom pom. With our seed receiving plenty of water and sunlight, our seed was beginning to grow. He literally said, “Now I get it” which was SO stinkin’ cute and relieving! 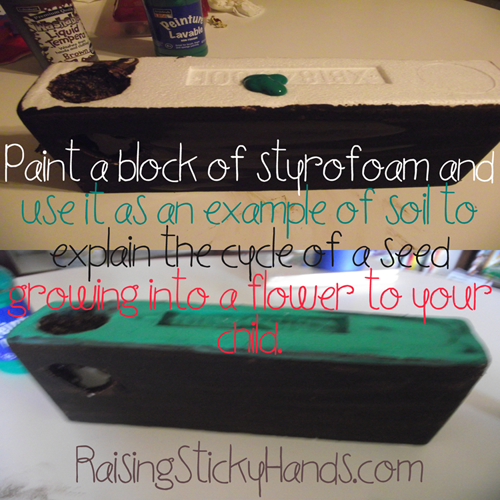 He made a little sprout from a pipe cleaner and put it in the styrofoam. Then he asked how it would become a flower… I told him it takes time, but eventually our little sprout would keep growing and it would bloom into a beautiful flower. He chose which pipe cleaners he wanted to use for his flower and with a little help from me created a gorgeous little stem and petals. Next he glued a pom pom to the center of the flower and inserted it into the styrofoam. When it was all done, he was so proud of his creation. I asked him to tell me what each piece was and what was happening with each step. Even hours later he still had it all down pat. SUCCESS!!! 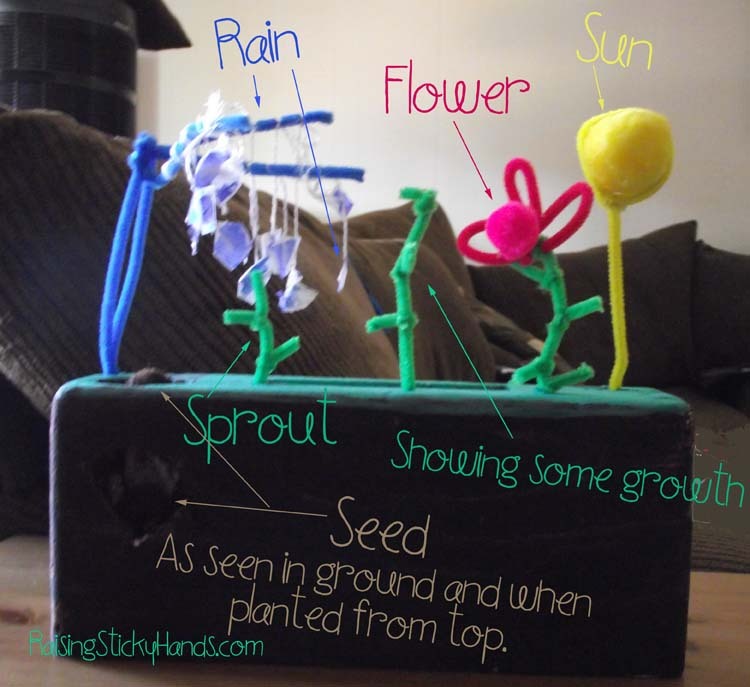 As we sat and enjoyed his little artwork, we read Planting a Rainbow , Jack’s Garden , The Tiny Seed (World of Eric Carle) , How a Seed Grows (Let’s-Read-and-Find-Out Science 1) . It was a wonderful time of learning for him, teaching for me, and spending time together as a whole. We made some lasting memories with this lesson. That’s one of the many reasons I love homeschooling! While reading this series, have you come up with any ideas for Crafty Lessons? Are you enjoying these posts or do you find them silly? Should I consider making this a weekly link up? I’d love to know! This really wasn’t supposed to be today’s crafty lesson. The paint on the other lesson was taking WAY too long to dry, so we had to move right along… I really should have done all of these lessons LAST week. Lesson learned! Be more organized! Now you know why today’s post is so late… Sorry! Tommy has been writing letters back and forth with Emily’s little girl, Adah. It was important to both Emily and I that our children learn to write letters and have pen pals, so this worked out great. These two hilarious little kids have been writing letters to each other for quite a few months now, so I thought it was time to explain to Tommy what exactly happens to the letters he sends to Adah. First we began by writing a letter. As soon as the letter came to an end, I asked Tommy “Where do you think this letter will go? How will it get to Adah?” He replied “Francis (our mail lady) will take it to her.” I went on to explain that while, yes, our mail lady will take it from our home, it will take a process to take to Adah that our mail lady isn’t involved in. Whether riding in a truck or on a plane, it has to get across the country some how. Once it arrives there it has to be sorted and take a couple other short rides before Adah’s mail person delivers it to her house. As we were discussing this, we cut the letter into strips. Taping each strip to each other, we made one long strip of paper. 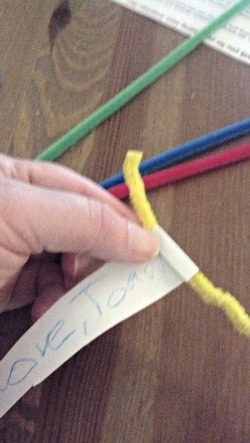 With the strip we created a scroll by winding the strip of paper up around one pipe cleaner. 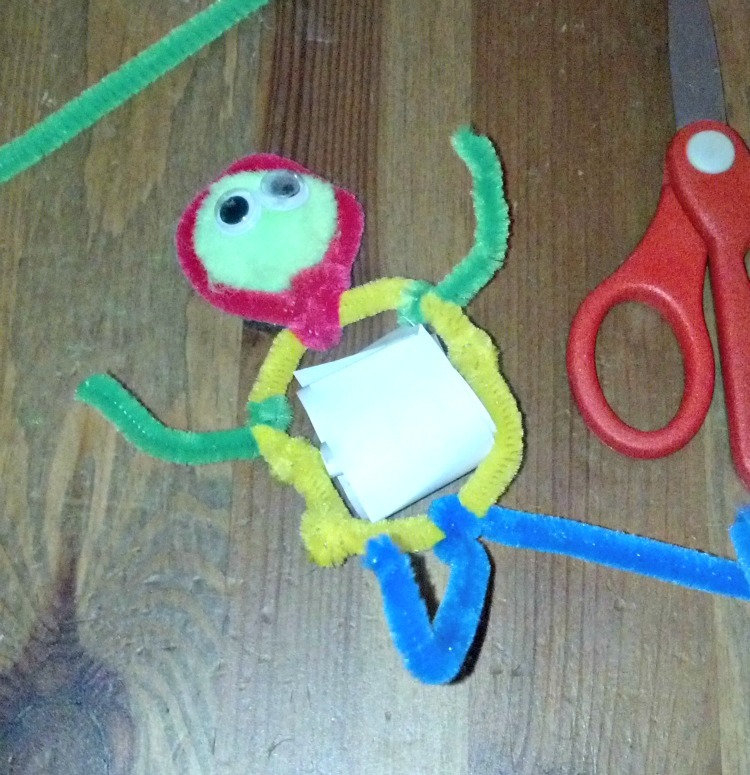 Once the scroll was created, we made a belly, head, arms, and legs for our little mail man, and then attached it all together by just winding the ends of pipe cleaner around another pipe cleaner. Once all of that was done, we topped it off by inserting a pom pom into the head piece for a face and then gluing on some eyes. Before going into a (rather LARGE) envelope for Adah, our little guy made his way around the house on a little toy truck. 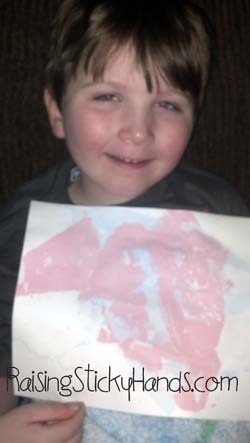 Now our mail man is off and on his way to Adah, where he will deliver the letter Tommy wrote for her. For this blog hop, my topic will be Crafty Lessons. This method comes pretty easily to me, because there are 3 things I just love to do: Talk, teach my children, and crafts. 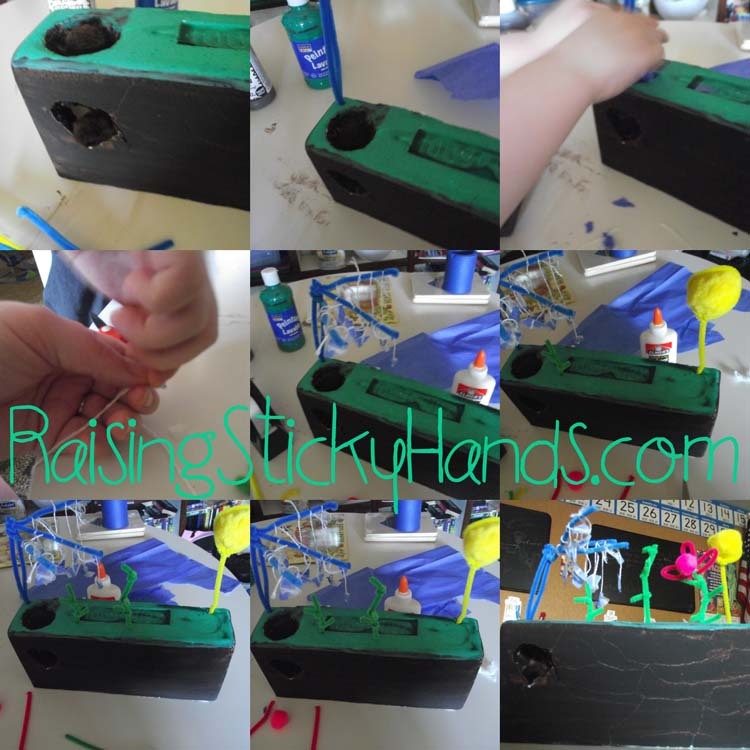 By teaching with crafty lessons I am able to do all 3 of those in our homeschool. 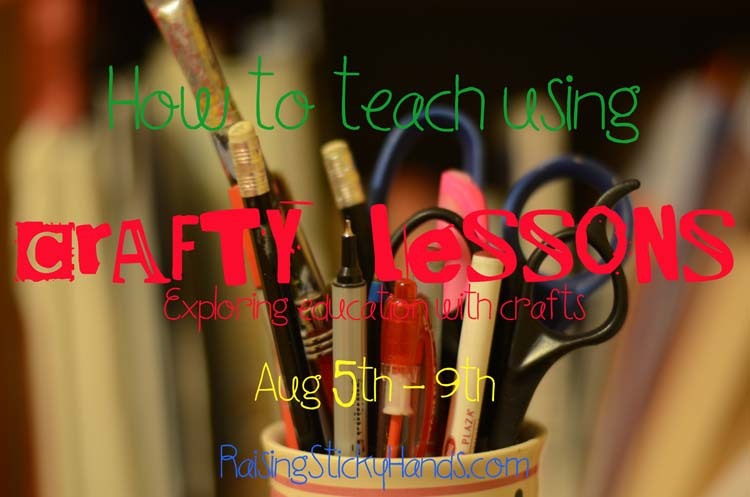 How exactly does one teach with a craft lesson? Well, first, you have to get creative. I usually use this method for something that would be otherwise difficult for my children to grasp. Let’s take for example, teaching my children the importance of caution with who they allow to influence them, and the influence they have on others lives. That would normally be nearly impossible to explain to a 5 year old, but I noticed that in his little life this was something he really needed to understand. I was able to teach this lesson to my son Tommy in a way that he would not only fully comprehend, but remember and put into use while having a tangible reminder of the lesson that he learned. So you have your concept that you need to help your child grasp. How do you use a craft to teach it though? Some of lessons are pretty easy. For example there are a plethora of ways to explain blood cells, planets, or the alphabet with a craft. But some concepts, and even full subjects, are much more complex. When this happens, there are a few things I do. First I either look at the text book we are using or just go straight to google. I get a visual picture of what I am going to be teaching. (If it is not something physical, I use a dictionary to get a clear definition.) Then I do some research to find out every single detail of what I am dealing with. Crafts can sometimes come out looking not quite right if you don’t get the little details just right. Next, I consider 1 of 2 things. If it is a physical object that is the focus, I make a list of supplies that would have a similar texture to the item. (Never be afraid to just have the child paint or draw a VERY detailed and labeled picture of what you are teaching if it is just going to be way too difficult to match up what you are teaching. While most lessons can be taught with a craft, once in awhile there is something way too difficult or expensive to recreate. That’s okay.) An example would be if for some reason I wanted to create a bear. I could use fur, felt, fleece, cotton, etc. For a concept, I would consider what exactly the action of that would be and try to think of a substance or material that could help bring the thought to life. If at this point I am unable to have an epiphany that causes me to annoy my husband with my wonderful idea and call my mom and best friend to share my excitement, I hit google and pinterest and type in the substance or material I want to use and “craft”. Easy peasy. At craft time, instead of the kids watching me while I explain the lesson, we dive right into the craft. As we are going about our time of fun, I talk… a lot. I explain every detail of not only what they are to do with the supplies before them, but what I am teaching them. I get very repetitive and let them ask me questions, and I ask them questions as well. Just as I love to have discussions with friends as we craft together, my children and I do the same. This is a great way for my children to learn. They are very hands on, visual, auditory learners. Teaching them with crafty lessons just seems to be a great fit for them, among many other methods. So just how did I explain the concept of influence? I don’t know how to explain it, but tissue paper bleeding just came to me. 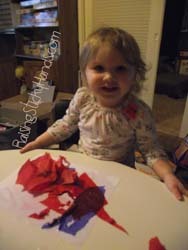 Tissue paper, especially the cheap low quality kind, bleeds when wet and stains everything it touches. The same goes for the influence of others on us. Not one single person we meet in our lives goes without touching us in some way. It’s just that some make more of a difference than others, particularly those we spend a lot of time with. 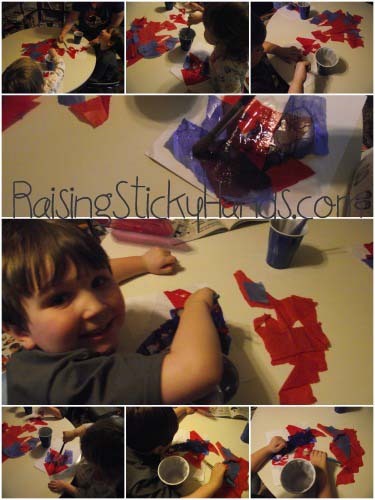 This fun activity is so easy, a toddler can do it. The best part is you don’t have to worry about a mess being made or taking a lot of time to clean up. Toddlers Can Learn About Influence Too!!! I had the children sit down and gave them each a white piece of card stock. I told them to pretend that this paper was them. 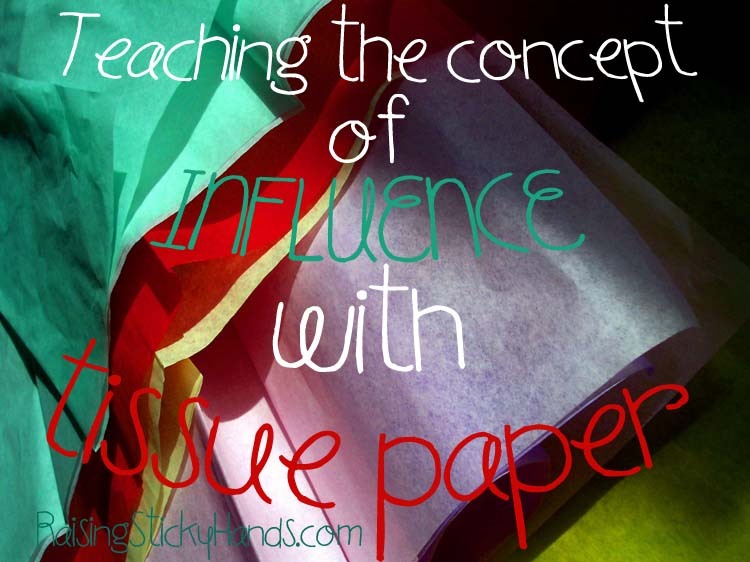 Right away, before I got a big “huh?”, I had them help me rip the tissue paper into pieces of all different sizes. I explained during this time the meaning of the word “influence”. That there are people in our lives, like our pastor who are a good influence on us, for example our pastor. However, there are also friends and family in our lives that as much as we don’t like their actions or words that come out of their mouths, they still have an impact on our thoughts, actions, and words. We may not notice it right away, but eventually if we are not careful, the bad influence will start to seep in and do damage. I went on to explain that this damage can be repaired by carefully breaking bad habits and spending more time with those who have good influence, but we should be careful in who we select to spend a lot of time with or look up to. Next, we started placing one sheet of tissue paper at a time on various places of the card stock, “painting” the water on to the papers. This took about 10 minutes or so and was just enough time for us to talk about how we should not be mean to those who have a bad influence, but should show Christ’s love to them. That we should strive to be a good influence to others, especially those who are not always showing such great character traits. I used Acts 20:28 to point out that influence is mentioned in the Bible and that we are instructed to be cautious in our approach with others. Tommy stated how sad he would be if someone else did something bad because of something he said or did. At that moment, I knew I got through to him. Hours later, when the papers were dry, we peeled off the dry tissue paper. Immediately Tommy noticed that there were both the “good” and “bad” colors on “him”. I made sure to point out that there were some parts where the blue was covered by red, so much so that the blue was very faded. The same goes for us, that when we have been influenced in a way that is not healthy, we can change our path and “fade out” the bad. Then Tommy taught me a lesson, “Mama, the paper can also be the earf (earth), and I want my influence on it to be good.” I think it’s safe to say, this crafty lesson was a success! So, what do you think? 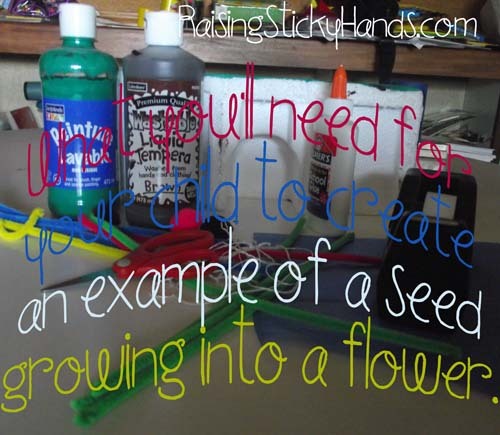 Like the idea of crafty lessons? Does it sound too complicated to you, or have you actually done some yourself?